Britain is on a “cliff edge,” with men, women and children preparing to flee to join the Islamic State (IS, formerly ISIS/ISIL), MPs warned on Thursday. They called for a stronger “counter-narrative” to prevent young Britons traveling to fight in Syria, as well as stronger support for families, as more and more youngsters become radicalized online. The Commons Home Affairs Select Committee said there was now a real danger that police, security services and others are failing to prevent more departures. “We are in danger of failing to prevent even more departures,” said committee Chairman Keith Vaz. “Radical groups from abroad are preying on young British citizens through social media to encourage them to travel abroad to join them,” said Vaz. “The number of cases being brought to public attention should ring alarm bells. Schools and the police must inform parents immediately, and work with them even if there is the smallest hint of radicalization, or a close association with someone who is thought to have been radicalized. Social media firms like Twitter and Facebook must suspend accounts which promote violent extremism, the cross-party group of MPs said. The committee suggested the launch of a helpline on which parents can express concerns about their children. They also urged for better communication between all the parties involved. “The police must engage in a regular and open dialogue with schools and community groups to ensure that information is exchanged and new initiatives can be explored at community level,” the report said. 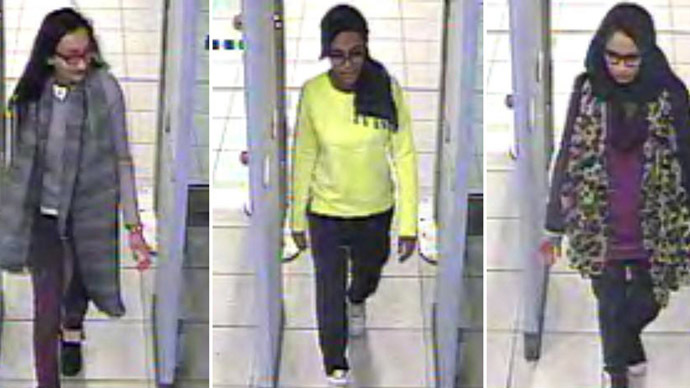 The investigation was launched after three teenage girls – Amira Abase, Shamima Begum and Kadiza Sultana, all from East London – flew to Istanbul last month. They are now believed to have crossed the border from Turkey into Syria to join the IS. The Metropolitan Police Service recently apologized for its failure to communicate directly with the missing girls’ families. The committee also wants the Home Office to work more closely with airlines and border officials that serve Syria, Iraq, Somalia and Nigeria to develop stricter controls on passengers traveling on those routes.